One and a half years ago I decided to follow a crazy dream, to come to the United States and pursue my master’s degree. If that’s not scary enough, I also decided to go to RIT, one of the top 100 universities in the nation. I’m not going to lie to you, I was a little scared when I arrived to RIT – those big brick buildings can be a little intimidating on the first sight. Luckily my fears started to disappear as soon as my classes started. I can still remember my first day of class like if it was yesterday. The day before classes started, I was so nervous that I couldn’t sleep, and, because of that, I arrived late to my first class. I remember how my plan of keeping a low profile on the first days went down the toilet as soon as I opened the door of my classroom and everyone (including the professor) turned around to look at me. Luckily professor told me: “Don’t worry, it’s the first day” and everyone else just laughed. Because I didn’t do my undergrad studies here in RIT (or in the US), I was afraid of not having the required level and being behind the rest of the class. Since day one, all my professors made me forget this fear. It’s amazing the level of care the professors have for their students here in RIT, and the accessibility that you as a student have towards them. There is no such thing as a “stupid question” for them, and you can go at any time during their office hours to ask all your doubts. In terms of fitting into the RIT community, I can assure you that you’ll find your place in it. You can easily realize the amount of diversity in the campus by not just looking at the student population, but also hearing students speak multiple languages around the campus. Even though we are considered to be a university of “nerds” by many, you’ll find tons of fun activities to do in the campus each week and, joining any of the 100+ student clubs will help you make friends. Throughout my three semesters in RIT I grew as a professional and I made friends from around the world. I gained core skills in my profession as a Mechanical Engineer, and I also gained real experience. During the summer I was able to do an internship with a company here in Rochester which helped me earn a lot of experience and some money too. And now that I’m reaching the end of my program, I found another internship in California with my dream company Apple. His research is focused on realizing thermo-optic tuning of silicon waveguides using metal heaters. This will entirely be an in-house fabrication (within RIT’s clean room – Semiconductor and Microsystems Fabrication Laboratory) and the goal is to include the process as part of the 2019 – MCEE 789/ MCSE 889 Photonic Integrated Circuits curriculum which will enable students to integrate the fabrication of active photonic components with the existing passive devices. Have questions? (Don’t worry, we do too!) 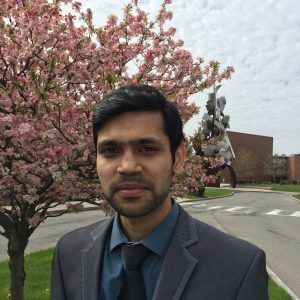 You can learn more about Venkatesh’s research group, the RIT Integrated Photonoics Group on their website. Ever wondered what kinds of engineering goes into making of a run-of-the-mill cellphone? Well, there is no definite answer. In fact, in the deeply interconnected world that we live in, every engineering marvel that is seemingly so obvious is the result of people from various parts of the spectrum coming together, sharing ideas and putting all the pieces where they belong. RIT recognizes this and has been trying to instill the same spirit in research as well as in the coursework that students take. Being a graduate student in the Computer Engineering department, I can vouch for the broad base of courses that I am allowed to take as a part of my degree. I have already decided to take a course from the Electrical Engineering department and hopefully another from the Computing Security department. Taking relevant courses from outside our department not only broadens our knowledge base but also brings about an interdisciplinary area of expertise which both the research community and the industry requires. Much like this bridge which connects the College of Computing (left) with the College of Engineering (right), RIT students go beyond disciplines to innovate and collaborate! RIT also encourages you to mix with faculty and student researchers from other disciplines. It is not mandatory for you to pick a graduate advisor from your department. I have personally known many graduate students to align with an advisor outside their department because they either had common research interests or some relevant background which made him a good fit. For instance, a friend of mine from Computer Engineering chose a Professor from Computing Security to be his advisor because he was looking for security as his focus area and his communications background made him a good fit for the Professor who was working on wireless security for IOT devices and vehicular communications. This approach has been very well-admired by companies that come to hire RIT students during the career fair. Companies across the board, from Amazon and Google to Microsoft, as well as numerous local industries based in the Rochester area are impressed by the talent and preparation of RIT students. Our graduates are well-prepared to hit the ground running. Alumni return to their alma mater and further encourage students to participate in cross-disciplinary projects and research collaborations. The greatest piece of advice from myself to other students considering RIT is to never be afraid to ask questions – to others and to yourself. It is going to be your greatest asset and a tool not only in your time as a graduate student trying to explore a research problem but also in the later stages of your career! 1) Snow Boots and Jacket: It gets very slippery when the snow melts and turns to ice so make sure you have a good pair of snow boots. Also, get a jacket that has fur lining on the hoodie because it keeps the snow falling all over your face. 2) Exercise: The cold weather is going to make you lazy and sleepy all the time so make sure you exercise in the winter to avoid those extra pounds and be more energetic. 3) Dry Skin: Your skin and eyes will be extra dry during the snow season. First and foremost cover yourself, get a good moisturizer and a humidifier for the home. 4) Emergency Kit: Snowstorms are not very common but I would still ask people to keep an emergency kit which has things like a battery pack, flashlight, snacks, etc. 5) Stay Healthy: Falling sick is a common thing in the snow season so always make sure you have a hand sanitizer with you, get good amount of sleep and exercise. These are some of the main things that you need to look out for but there are many other like being careful while you drive in the snow. As I wrap up the article later in the day and looking for a conclusion by wandering outside the library, I see the sunset and a little snowfall which made me realize that I have a love-hate relationship with the snow season at RIT. There are days when I am looking forward to getting out of Rochester and another day when I realize how much I love the snow. Oh before I forget, the man in the picture is President Destler who retired in 2017 and was the 9th president of RIT. It only takes a moment to change everything! So, let us go back a little more than 3 years from now. It was August 2013! I had a very productive discussion with my team-lead at Ericsson who was working there years before I joined Ericsson in 2010. He was hence, pretty experienced as far as work and the business trends were concerned. And I, being a new GET (graduate engineer trainee), was always interested in listening and analyzing any advice that a senior would give to me since I could always catch something to learn in what they said. I actually considered myself really fortunate in this regard that my seniors thought me as able enough to understand them and hence, always guided me through things voluntarily even when everything went smooth and I most welcomed it each time! So, that day in August 2013, my team-lead told me that I was limiting my fascination. That the product and the software upgrade procedures that I was keen on mastering would only help me in Ericsson and nowhere else in the world. At first, I was a bit disappointed but after a lot of research, I realized that the Ericsson platform I worked on was excellent but used only by Ericsson and nowhere else at all! And I? I was early in my career and I wanted to be flexible enough as far as my competency is concerned so that I can show my work to others as well and gain appreciation at an inter-organization level and not just within the organization. I was already troubled by it and I kept on finding things not knowing what I wanted. Some weeks later, in September 2013, I had a long discussion with an AT&T US engineer about the upcoming changes that Ericsson was planning to make in order to keep up its top position. During that, I was amazed how that engineer who was same age as mine, was literally talking technology! Yes, indeed! I felt like he wasn’t speaking English but he was actually talking technology! And moving totally away from the topic awkwardly, I asked him what he studied as I explained how fascinated I was with the kind of knowledge he had. He was humble and generous enough to tell me a few things. He also shared some docs that he asked me to go through to get a clearer picture of what he was talking about. I went through that and understood that it was exactly what I wanted to learn. The whole internet technology! One which Ericsson or AT&T or any organization in the world uses now and in the future i.e. the Internet technology! As much as I felt incomplete then, I also had found a way to not only learn but to be able to get rewards back for my learning. I could work on multi-company platforms with the same knowledge as no matter what equipment a company used, they would ultimately use it for the same purpose and i.e. the internet! I had decided to learn the fundamentals of networking now and shift my domain from Wireless. And, on further research, I had also found my destination to have the same. None other than the United States of America where, networking technology is the ultimate backbone of the country’s economy. The universities here like RIT not only want their students to learn something new, but make sure that the technology that they learn is up to date and at par with the demands laid down by some of the internet technology giants like Cisco, Amazon Web Services, Facebook and uncountable names more. Thus, I decided that I should rather get into something 100% which I’m interested in, than just being able to manage to study something randomly after my work hours at Ericsson. This whole process did take a lot of time and effort. In point of fact, I had stopped going anywhere on weekends too as I wanted to utilize that time I got, in researching further about studying networking from the US universities including RIT. It was then, in November 2013, when I had finalized that I wish to pursue MS. So, I am always curious and willing to learn. To add, I am also the recipient of the prestigious ‘ACE’ award by Ericsson but having worked for almost 4 years for the company, it was now time to move on in pursuit of more knowledge and those 4 months from August to November played a crucial role in my decision making for pursuing higher studies in the US. So, this is the story, my experiences, as to what really motivated me to take this nervous step of leaving ‘everything’ behind like my job, family, friends, my girlfriend, my home, my food, that weather, those sweets, those spices, those festivals, those dresses, those dances and what not! In point of fact, it was a nervous step for me to leave that ‘FEELING’ behind! But, like my mom told me that one has to sometimes give up something close to the heart in order to gain something. And after all, they are all always there for me anyway. So, with a heart filled with sorrow, excitement, motivation, happiness, tears, a smile, and simply every emotion you can think of, I decided to move on towards my pursuit of a Masters degree here in the US. Disclaimer: This is the first blog of my life that I wrote and, as a proud RIT TIGER!